Charles Dickens wrote for a public that embraced reading as recreation. So long as a novel’s content didn’t bring a blush to the cheek of a virgin, Victorian Brits were down with fiction. Nineteenth-century England saw a boom in literacy thanks to innovations in the printing process, which increased efficiency and cut cost. Periodicals were the first to take off in the publishing revolution. As prices dropped to mere shillings, readership expanded to include the working class. When Dickens entered the literary scene in 1836, monthly and weekly serials were already the hottest print medium. Novelists used the piecemeal approach to build reader involvement and investment. These days Dickens’s books are staples in literature classes worldwide, but he was king of the mass market to his contemporaries. One look at a copy of All the Year Round, the literary magazine founded and edited by Dickens, reveals the careful commercial packaging of his work. Advertisements for everyday products brush up against the featured stories. By the time his 13th novel was underway, Dickens was a bestselling author and adored public figure. Over the course of 36 weekly installments (from 1860 to 1861), readers of Great Expectations would come to feel an immediate connection with narrator Pip. Once again the installment plan pushed Dickens to be a meticulous plot architect, building suspense at both the micro and macro level. But faced with the deadline for the final chapters, he was stumped. A lot was riding on the ending. Fans had invested a year of their reading lives to following Pip’s bildungsroman. 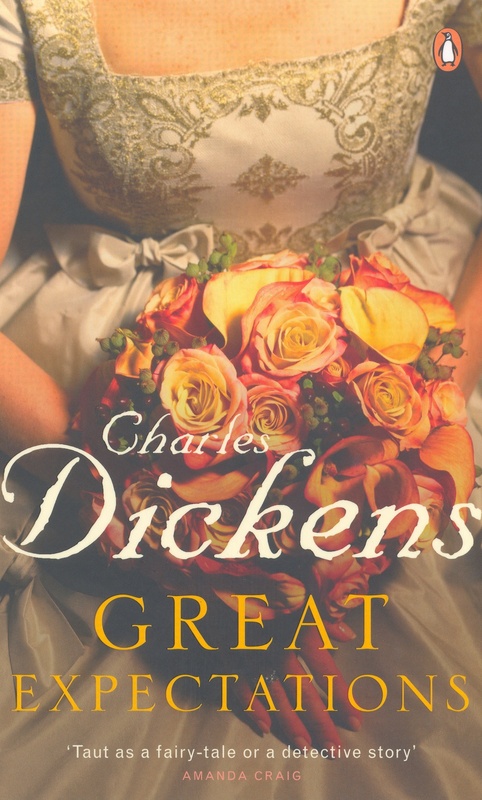 After delivering twists involving Pip’s benefactor and Estella’s parentage, Dickens couldn’t disappoint in the final pages. The problem lay in reuniting Pip with his fallen dream girl. The original ending, written in June of 1861, has Pip spot Estella’s coach in Piccadilly two years after his return to England. The encounter is strained and sorrowful, as Estella recounts her marriage to the abusive Bentley Drummle. Though she’s learned compassion, what Pip felt for her is in the past. The two part as swiftly as they meet with no hope of reconnecting. Dickens had lingering doubts about Chapter 59, and before going to press he sought the advice of friend and fellow writer, Edward Bulwer-Lytton. The downer of an ending didn’t go over well with Bulwer, who held fast that “the soul of a very long fiction should be pleasing.” He urged his friend to provide a cheerier conclusion for readers. Critics of the revised ending shouldn’t assign too much blame to Bulwer, though. By necessity, Dickens had always been sensitive to fans’ reactions; if he dropped the ball one week, readers might not come back the next. He was known to change course part-way through a serial to satisfy the public. Whatever the motivation, Dickens crafted a new ending for Great Expectations: the one that was published on August 3, 1861. Though ambiguous, the second ending doesn’t rule out a happily-ever-after conclusion for the main characters. This version places the pair’s meeting in the garden of the ruined Satis House. As in the first ending, Estella appears “saddened” and “softened” by her abusive marriage. She suggests they will “continue friends apart,” but as Pip takes her hand to leave the garden he “[sees] the shadow of no parting from her.” It’s not a marriage proposal, still it leaves room for optimistic readers to make that leap. In rewriting the final chapters of Pip and Estella’s story, was Dickens trying to have it both ways, catering to the public without compromising his vision? Over 150 years since their publication, the two endings continue to inspire debate. It wasn’t until John Forster released his biography of Dickens in 1874 — after the author’s death — that readers were made aware another ending existed. Once the secret was out, critics had something to gripe about. Arguing that Dickens had botched both attempts at a conclusion, some went so far as to write their own. (Apparently the unfinished manuscript of The Mystery of Edwin Drood wasn’t enough to keep them occupied.) In George Bernard Shaw’s 1937 edition, the original Piccadilly ending gets top billing. Shaw banished Dickens’s revision to the postscript, with a snide editorial: “Sentimental readers who still like all their stories to end at the altar rail may prefer this. They have their choice.” These days it’s the revised ending that appears in most editions. I read Great Expectations for the first time in high school. It was an assignment to be read in large chunks, not measured out in leisurely installments. My reading was accompanied by scholarly footnotes instead of advertisements, and I didn’t sit by the hearth with my family as we acted out favorite passages. Even without the Victorians’ hype and investment, I had an opinion about the endings. I wanted to rescue “The Ending as Originally Conceived” from the appendix of my Penguin Classics paperback. I wanted Estella to drive off in her coach, leaving Pip to die a bachelor — a fate he deserved for failing to appreciate the wise and generous Biddy. Rereading the book and its endings, my view has shifted. I can see the emotional accuracy and appeal of Dickens’ revision. The mist-covered ruins of Satis House provide a dramatic backdrop, echoing Pip and Estella’s first meeting and the novel’s opening in the churchyard. There’s satisfaction and closure in this repetition. Dickens’ cryptic last sentence no longer smacks of compromise. The “shadow of no parting” feels more menacing than marital, implying that the pair are bound together whether they like it or not. The enduring questions over the two endings in turn raise questions about the gap between authorial intent and public response. Since publication, Dickens’s stories and characters have been handed over to the popular imagination. We continue to pen alternate versions and adapt his work to the stage and screen — and in the case of the unfinished Edwin Drood, we mount an elaborate musical theater production with multiple finales, letting the audience vote on the outcome. Whatever fault we may find with this ending or that ending, Dickens moves us to wonder about his characters’ fate beyond the final sentence.